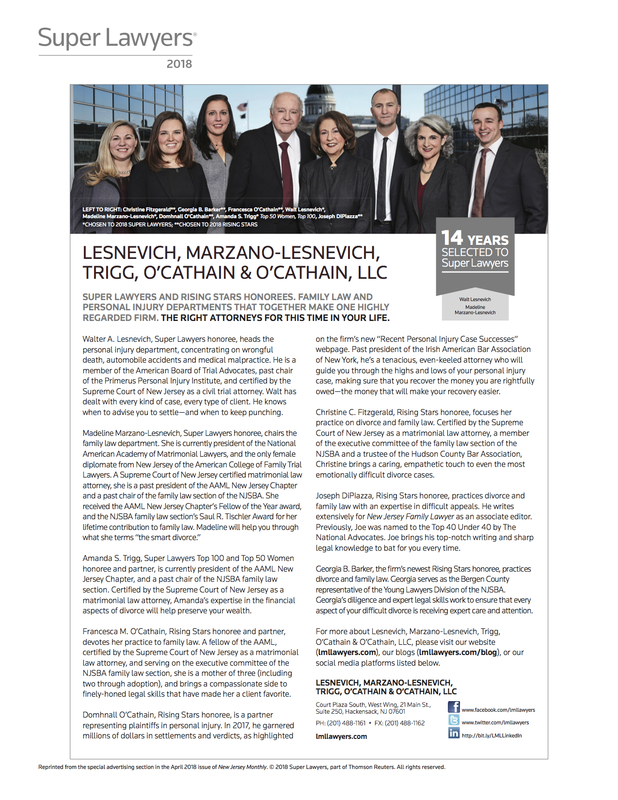 HACKENSACK, NJ , April 12, 2018	(Newswire.com) - Lesnevich, Marzano-Lesnevich, Trigg, O’Cathain & O’Cathain, LLC have been recognized by Super Lawyers and Rising Star Lawyers, for the 14th consecutive year! Walter A. Lesnevich, Super Lawyer, heads the personal injury law department, concentrating on wrongful death, automobile accidents, and medical malpractice. He is a member of the American Board of Trial Advocates, past Chair of the Primerus Personal Injury Institute, and Certified by the Supreme Court of New Jersey as a civil trial attorney. Madeline Marzano-Lesnevich, Super Lawyer, chairs the family law department. She is currently President of the national American Academy of Matrimonial Lawyers, and the only female Diplomat from NJ of the American College of Family Trial Lawyers. A Supreme Court of NJ Certified matrimonial law attorney, Madeline is a past president of the AAML NJ Chapter and a past Chair of the Family Law Section of the NJSBA. She received the AAML NJ Chapter’s ‘Fellow of the Year’ award, and the NJSBA Family Law Section’s Saul R. Tischler Award for her lifetime contribution to family law. Amanda S. Trigg, Super Lawyer, Top 100 and Top 50 Female Super Lawyer, is currently President of the AAML NJ Chapter, and a past Chair of the NJSBA Family Law Section. She is Certified by the Supreme Court of New Jersey as a matrimonial law attorney. Francesca M. O’Cathain, Rising Star and partner, is a Fellow of the AAML, Certified by the Supreme Court of NJ as a matrimonial law attorney, and serves on the Executive Committee of the NJSBA Family Law Section. Domhnall O’Cathain, Rising Star and partner, represents plaintiffs in personal injury matters. In 2017 he garnered millions of dollars in settlements and verdicts, as highlighted on the firm’s new Recent Personal Injury Case Success webpage. He is a past president of the Irish American Bar Association of New York. Christine C. Fitzgerald, Rising Star, is Certified by the Supreme Court of NJ as a matrimonial law attorney. She is a member of the Executive Committee of the Family Law Section of the NJSBA and a Trustee of the Hudson County Bar Association. Joseph DiPiazza, Esq., Rising Star, writes extensively for the New Jersey Family Lawyer as an associate editor. Previously Joe was named to the ‘Top 40 Under 40’ by The National Advocates. Georgia B. Barker, the firm’s newest Rising Star, serves as the Bergen County representative of the Young Lawyer Division of the NJSBA. “We are so pleased to be once again recognized for our legal expertise and professionalism in helping our clients through difficult times,” said Madeline Marzano-Lesnevich, Esq., at Lesnevich, Marzano-Lesnevich, Trigg, O’Cathain & O’Cathain, LLC. For more information regarding this exciting news, please visit http://lmllawyers.com/14-years-selected-to-super-lawyers/. 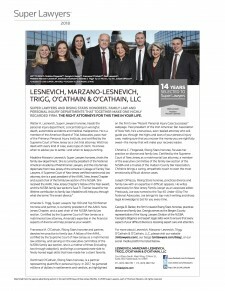 For more information on Lesnevich, Marzano-Lesnevich, Trigg, O’Cathain & O’Cathain, LLC, please visit http://lmllawyers.com/. For over 30 years, Lesnevich, Marzano-Lesnevich, Trigg, O'Cathain & O'Cathain, LLC, has been successfully assisting clients with personal injury and family law cases in the New York and New Jersey areas. Their roster of highly skilled and experienced attorneys help clients navigate through each case while always acting in the best interest of who they serve. The firm is committed to providing excellent legal representation for their clients and their families. If you have been hurt on the job or are going through a child custody battle or divorce, contact LMLTOO today and allow their experience to work for you. E-mail: info@lmllawyers or call (201) 488-1161 today. For more information, please visit http://lmllawyers.com, like their Facebook page (www.facebook.com/lmllawyers) and follow them on Twitter @lmllawyers (https://twitter.com/lmllawyers). Additionally, please call (201) 488-1161 or e-mail info@lmllawyers.com. Expert legal assistance in the areas of divorce, family law and personal injury.